Many of us have a nasty habit. We domesticate God. The irony is that it stems from a good motive. We want to know God, even have a relationship with him. So, we evaluate our human experience not only to see if we are Godward, but also to gauge whether God is in it. That motive may be right and good, but if we aren’t careful, we can assume that what’s true of our human experience must also be true of God the Creator. Why do we do this? We might never admit it, but we often assume God is just a bigger, better version of ourselves. If we have love, he just has more; if we have power, he just has more; if we have knowledge, he just has more. It is the all-too-common superhero syndrome. The difference between you and God, in this mindset, is merely quantitative. This tendency, though common, is grossly mistaken. God is not a bigger, better version of you—that simply creates a God in your own image, which Scripture calls idolatry. The God of the Bible, by contrast, is a different type of being altogether; indeed, he is Being itself (or absolute Being, as the church fathers liked to say). There is none like him. He’s in a class of his own. The difference, then, is not merely quantitative; it’s qualitative. As the medieval theologian Anselm put it, God is someone than whom none greater can be conceived. He is the Perfect Being. God is the Perfect Being because he’s not merely unlimited in size but also infinite in essence. While we are finite creatures, bound by limitless limitations, God has none. His essence is inestimable, immeasurable, unfathomable. Or to put it positively, God is his attributes in infinite measure (Ps. 147:5). That means, then, that anything and everything that would limit God—change, emotional fluctuation, divisible parts, dependence on others, a succession of moments, restriction to a locale, lack of knowledge, wisdom, power—cannot be true of him, lest he no longer be the perfect, infinite Being. But it also means, most fundamentally, that our God is incomprehensible. If he is infinite, then he cannot be exhausted by our finite minds. Even Moses, who was perhaps the closest a mere mortal ever came to approaching the immortal Creator, could not see God’s glory and live (Ex. 33:18, 20). The minute you think you’ve comprehended all of God, think again, for it’s not God you’re comprehending. What does this infinite distance between finite and infinite mean for our knowledge of God? It means that the way to seek him is not by pretending we can conquer his essence. Instead, we know him according to his revelatory works. If we know anything about God, it’s only because he has revealed it to us. It is only because he has—to use John Calvin’s imagery—stooped down so low as to lisp to us, like a nurse lisping to a newborn. Those humbled by his infinite incomprehensibility know this to be true: Revelation is a gift. How should this affect the way we talk about God? If he’s the infinite Creator, and we the finite creature, then our knowledge of him—even our language about him—cannot be univocal, as if we know things just as God knows them. Impossible. Instead, our knowledge of God and our talk about God is always analogical. In other words, something can share similarities with something else even though it’s not identical. That shouldn’t surprise us. We are not God, but we are made in his image, designed to reflect him in some way. Our makeup is analogical by nature. So too our words. While our finite words don’t exhaust the glory of our Creator in and of himself (univocal), they can say something true about him, even if in part (analogical). Not only do we see through a mirror dimly (1 Cor. 13:1), but we stammer through words obtusely, echoing the “heights of God as best we can” (Gregory the Great). First, it means we should understand who God is by talking about what he is not. Have you ever noticed how certain attributes—attributes that protect God’s incommunicable being—do just that? We are finite creatures and therefore change, for better or worse; we are mutable. Not God. He does not change; he is immutable. We are finite creatures and therefore fluctuate emotionally; we are passible. Not God. He does not experience emotional change; he is impassible. We are finite creatures and therefore depend on God for our existence and fulfillment. Not God. He does not depend on anyone; he is a God of aseity—self-existent and self-sufficient. God is not a bigger, better version of you—that simply creates a God in your own image, which Scripture calls idolatry. Our God-talk will be improved if we keep ourselves from ascribing limitations to God by first saying what he is not. Even when you do meet in Scripture divine attributes that are communicable—reflected in you, the creature, in some small way—always remember, they are true of God in a way that they are not true of you. You may love, but God is love, and he is love in infinite measure. You may become holy, but God is holy, eternally and immutably; he is holy in infinite measure. Second, it means we should read Scripture to understand what is literally true without reading Scripture literalistically. You may not know it, but you do this already. When Scripture says God has eyes, hands, or ears, you naturally assume something analogical is at play. When David prays, “Keep me as the apple of your eye” (Ps. 17:8), you don’t conclude God has physical eyes. You understand the infinite Being has no body; he is spirit (Deut. 4:12–16). David is employing anthropomorphic language, language that uses human characteristics not to attribute flesh to God but to metaphorically convey something true of him. In Psalm 17:8, David is praying for God’s steadfast love, his covenant blessing. And what better way to ask for it? Oddly enough, we don’t get it when we read passages that ascribe change or human emotion to God. When we read that God “repents” or “regrets,” we wonder if God has changed his mind or made a mistake. When we read that God “grieves,” we assume he must be emotional and suffer loss. But just as anthropomorphic language utilizes human characteristics, so anthropopathic language employs human emotions. That’s not because God is a passible, emotional being; as the eternal, immutable God, he is impassible, so maximally alive that he cannot become his attributes any more than he already is eternally. It’s clear there is no change in God when Saul tries to beg his way back, as if he can manipulate God like the passible gods of the nations. Samuel corrects Saul’s doctrine of God, and perhaps ours, too: “The glory of Israel will not lie or have regret, for he is not a man, that he should have regret” (1 Sam. 15:29). [It is] palpably absurd of you to be placing human characteristics in God rather than divine ones in man, and clothing God in the likeness of man, instead of man in the image of God. If our God-talk doesn’t respect him who is incomprehensible, we risk worshiping a glorified version of our own likeness. But if our posture is one of humility—faith seeking understanding—then our stammering turns into worship. We stand in awe and confess with Paul that our God “dwells in unapproachable light” (1 Tim. 6:16). Only in his “light do we see light” (Ps. 36:9). 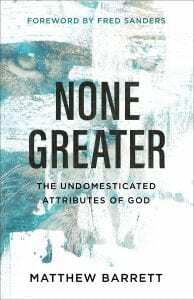 Check out Matthew Barrett’s new book, None Greater: The Undomesticated Attributes of God (Baker, 2019).